From three-years-old and dancing in the living room, to dreaming of a singing career in junior high, to studying musicology in undergrad — her passion for music has followed her into adulthood. Today, she’s a music studio owner, independent music teacher and business coach specializing in voice and piano. Entrepreneurship has given her the autonomy and confidence to pass her knowledge along to others across the US. 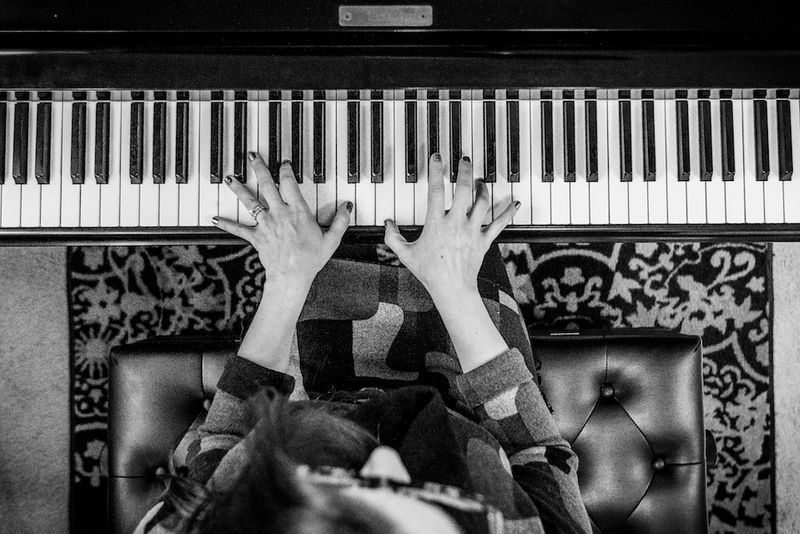 She advocates for her profession and rejects (the stereotypical) comments that belittle the hard work, grit and perseverance it takes to succeed in the music teaching biz — making her one hell of a BWH. Hometown: I was born in Roanoke, VA., but moved from there when I was 3. We lived in a lot of places: Virginia, Connecticut, Tennessee and a couple of locations in Western Pennsylvania. Very first job: I was a babysitter as a young teen. One of my first “official” summer jobs was working as a golf cart attendant, which was both terrifying and exciting for someone who didn’t have a license yet. Hustle: Owner of Sara’s Music Studio; Co-host, Upbeat Piano Teachers; Laser Coach, The Speakeasy Cooperative﻿. My mother. She’s the smartest and strongest woman that I know. She’s an amazing listener and treats everyone she meets with kindness. I want to grow up to be like her. Doing yoga, hanging out with my hubby and our 17-year-old cat, Grizabella, spending time with friends and acting or singing in local productions. Jane Eyre, for her strong convictions, courage and ability to love. A good red wine or a session IPA, please and thank you. It might be surprising, but as someone who is surrounded by music almost constantly, my power anthem is silence. My four grandparents. I have so many things I would have liked to learn from them. It’s not exactly a secret, but a lot of people assume that since I’m a performer and also work in a type of customer service industry that I’m a natural extrovert. Nothing could be further from the truth. My private voice and piano studio keeps my busy most of the day. I work primarily with elementary through high school students, and also quite a few adult students. Outside of the studio, I work as a continuing educator and business coach with independent music teachers (IMTs) all around the world. It’s pretty darn cool. Being an independent studio owner and biz coach means I get to wear all the hats! My workday starts somewhere around 9:30 a.m. and ends around 7:30 p.m. Thankfully my boss lets me take breaks as needed. During the morning and early afternoon I check in with my coaching clients, plan materials and videos for Upbeat Piano Teachers and touch base with my beasty boss voice teacher cohorts at The Speakeasy Cooperative. After school lets out, I switch gears and head down to the music studio. That’s where my Yamaha C5 grand lives. It’s a magical place. Have you always had a passion for music? Yes. My passion started pretty early. In fact, one of my first memories is dancing in the living room in Roanoke, VA. when I was 3 years old, trying to snap my fingers like my Dad as he listened to records. Music always played an important role in our house. When I was a junior in high school, I wanted to pursue a career as a professional vocalist and choir director. Later in undergrad I switched gears and wanted to become a musicology professor. I followed that passion to graduate school, taught at the financially depressing adjunct level for a while and then decided it was more lucrative and rewarding to work for myself as a solopreneur. Can you tell us more about your musical training? What inspired Sara’s Music Studio? My studio was born out of creative problem solving. In 2010 I was working three part-time jobs: teaching at two music schools and also as an adjunct at a local university. The work was fulfilling, but also very frustrating. I was constantly losing money because of cancellations, and I never knew from semester to semester how many classes I would get assigned. I didn’t have the space in my house to teach privately, and I felt stuck. Understanding my frustration, my father-in-law suggested I rent a small unused room downstairs at his business, Shenango Steel Buildings. So, my husband and I moved our little Kimball console piano out of our house and into what became Sara’s Music Studio. That was just the beginning. Eight years, a room expansion and a grand piano later, my studio continues to thrive and evolve. Every summer I collaborate with local teachers to offer creative workshops. Students get involved in community outreach through fundraising and giving holiday recitals at retirement homes. Most importantly, it’s a safe place where musicians learn and grow. What inspired your involvement with Upbeat Piano Teachers and The Speakeasy Cooperative? When I first started blogging at sarasmusicstudio.com in 2014, I had no idea what might come out of it. Every morning I’d sit at the computer with my coffee, writing blogs about whatever I was doing in my studio. It was my way of stretching my creative muscles. After a time those posts started getting noticed. One day I got an email from Tracy Selle, a piano teacher in Texas who was putting together a webinar about piano teaching and business advice. It started with a single interview, then a six-hour course, and now we’ve put together so many resources I’m starting to lose count! Teaming up with Tracy Selle at Upbeat Piano Teachers has been an awesome adventure. At the beginning of 2018, I joined The Speakeasy Cooperative, an amazing group of independent voice teachers. Michelle Markwart Deveaux, the founder and curator, is a coaching powerhouse of awesome. She inspired me to take my own business coaching to the next level, and when I did, amazing things happened. What have I learned from these experiences? Networking is a beautiful thing. It takes a lot of effort, but when you put yourself out there, people will notice. The vast majority of independent music teachers (IMTs) are women. Some of us work in music schools or own standalone business, but many of us work out of our homes. Those stereotypes about the “little old lady who teaches _____ down the street” are still prevalent in our society. (Side note to the petite mature women out there teaching lessons: I see you, and you rock.) We’re not “just piano teachers.” (Or voice teachers, guitar teachers, clarinet teachers, etc.) We don’t teach because it’s a hobby or a supplement to our “real job.” We’re professionals with education, training and experience. We teach because we’re darn good at it, and for many of us, it’s our only source of income. One of my primary focuses as a business coach is to empower my fellow colleagues to learn how to value themselves as professionals. It’s time to eliminate the business-killing “just a _____ teacher” mentality so that IMTs can focus on what we do best: being amazing music teachers. There are some amazing bloggers and creators out there. Nicola Cantan is probably one of my biggest idols. Her output of creativity at Colourful Keys is absolutely astounding. I also enjoy reading and following Joy Morin, the creator of Color in My Piano. Be true to yourself and know what kind of client you want to teach. Don’t just take every inquiry that comes your way! That doesn’t serve you or your potential clients. Put your passions out there when you advertise: performance, competitions, improvisation, composition, etc. When you market to your ideal client, you’ll build a studio that you’ll love. And then you’ll never work a day in your life. Just kidding. You’ll work a lot. Probably more than most. But you’ll love it. Make time for play. It’s easy to get caught up in the hype of being “busy,” especially if you’re self-employed. Stop. Take a breath. Look around you. There’s so much more to life than just working. Lulus is the online destination for chic, sophisticated, feminine, and modern fashion, providing a curated collection of event-ready dresses and party-perfect separates for every occasion. Click here to enjoy $15 off + free shipping on orders of $150+ using code "take15". *This is an affiliate partnership. That means when you shop using the links we provide, a portion of your purchase comes right back to us, so we can (1) keep the lights on and (2) continue creating content that matters. Of course, we only promote brands and products we genuinely stand behind. Thank you so much for your support!